Sending out a thank you letter after an interview always leaves a good impression on the interviewer. It can also increase your chances of bagging the position you interviewed for. To make it easy for you, we have a wide range of professionally drafted and ready to use sample thank you letter after interview templates. These Sample Letters are easy to download and are available in a variety of formats to choose from. The sample thank you letter after job interview has space for the job applicant to fill in details of the name of the recipient, job title of the recipient, name and details of the employer and other relevant information. 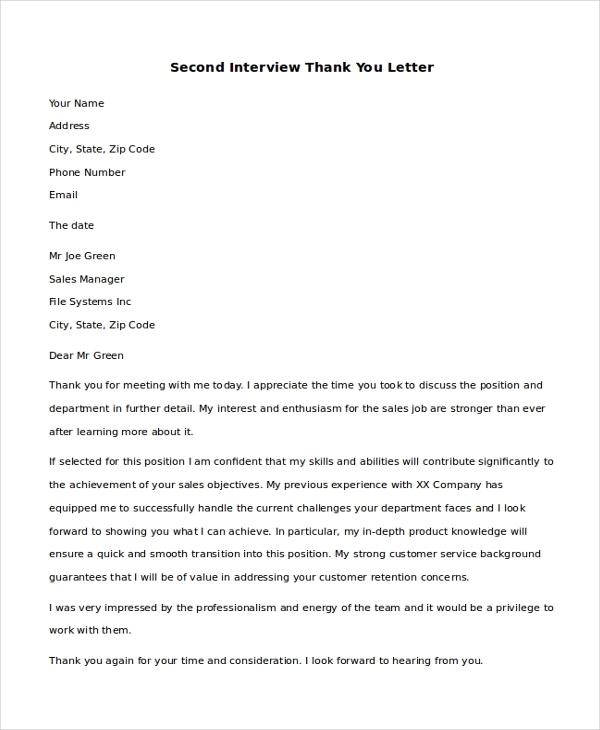 The sample thank you letter after second interview template has space for the user to add details of the interviewer, his personal details, and other relevant information. This template can be easily printed out or even copied, pasted and emailed. 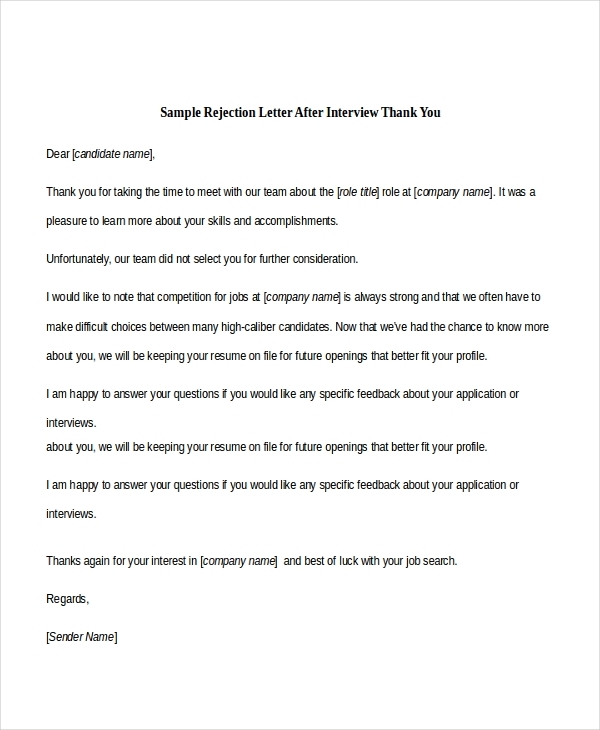 Employers and interviewers who have rejected certain candidates for the job post can use the sample rejection letter after interview thank you template. This template is available in Word format and can be easily edited. You can also see Sample Resignation Letters. The sample thank you letter to a recruiter after interview template is ideal for those who wish to thank a recruiter who recommended them for a job position. 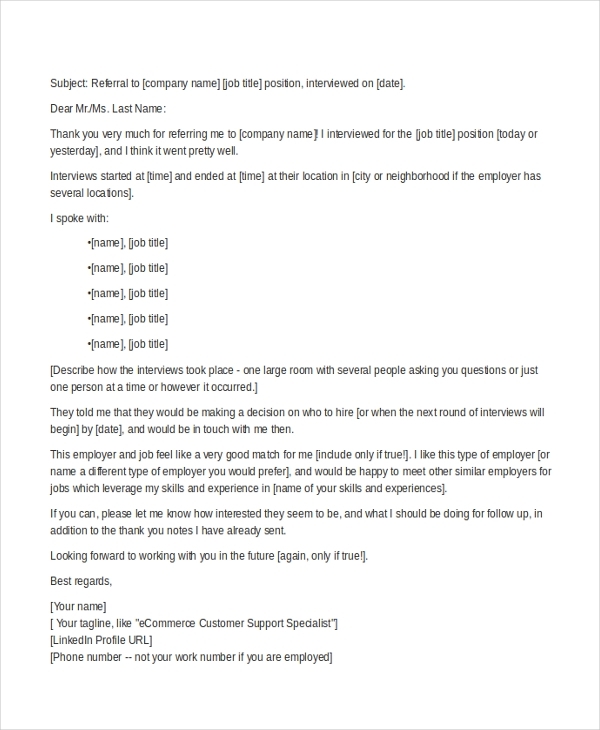 This sample letter can be copied, pasted and edited. The post-interview thank you letter is available in PDF format. It is a professionally drafted letter and can be both emailed as well as printed. Job applicants for all types of the post can use this template. you can also see Example Cover Letters. The post phone interview thank you letter is available in PDF format. The user can add his name, address, contact number and other details to the header of this letter. This template is printer friendly. 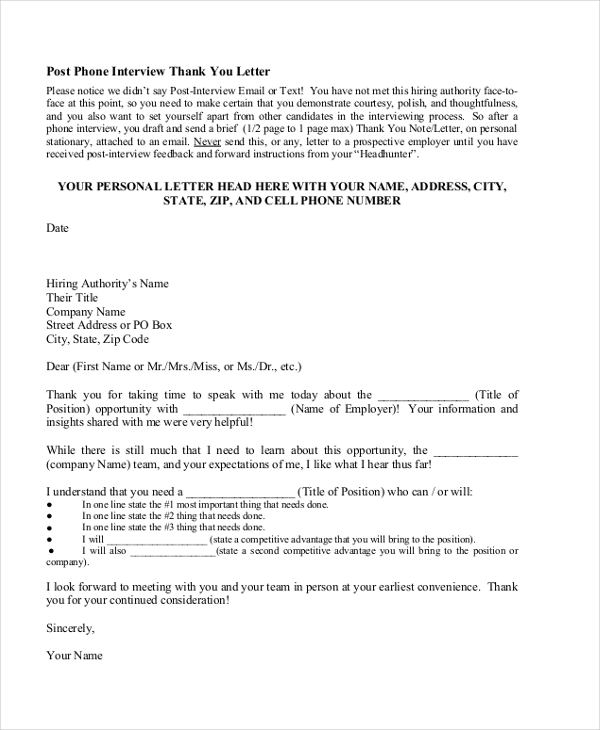 The thank you letter for an interview example template is available in PDF format. This template is printer friendly and can also be emailed. Teachers and professors applying for job positions in schools and colleges can use this letter post their interviews. Job applicants who have completed an interview with a prospective employer often wish to thank the employer for the interview. Such applicants can use the thank you letter after interview templates. Applicants who have been interviewed telephonically can also use these templates. Some examples of job applicants who can use these templates are teachers, sales executives, marketing executives and so on. 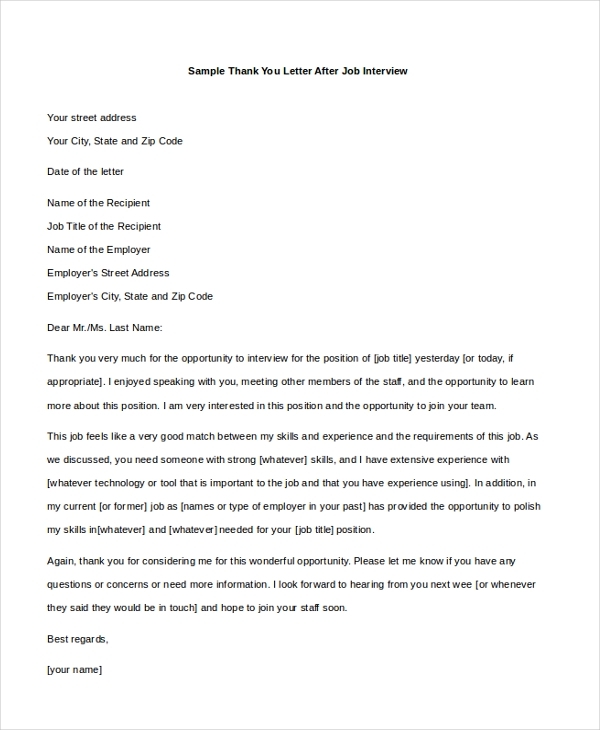 Additionally, even employers who wish to send out reject and thank you letters to people who interviewed for the job can use some of these professionally drafted templates. You can also see Reference Letter Sample. With the help of these thank you sample letters, you no longer need to stress about drafting a thank you letter from scratch. Just use one of the above-mentioned templates we have to offer to get the job done quickly and efficiently. All you need to do is download the template, edit it, print it out and send it to your interviewer. you may also see Resume Cover Letter Examples.